Izil Natural Argan Beauty infuses the world's rarest natural oil, argan oil, with only the finest natural ingredients.The result is a range of argan oil products that will nourish, protect and accentuate the natural beauty of your skin. 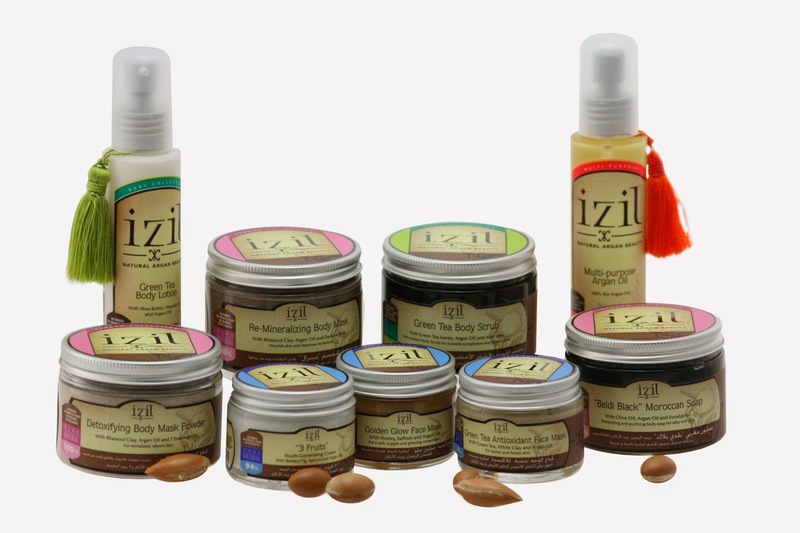 The word 'Izil' is a Berber word meaning 'pure'.Each of Izil's products contain potent, antioxidant rich ingredients, including plant, fruit and essential oils, expertly blended with the highest concentrations of argan oil to ensure the best quality products available in the Middle Eastern market. Izil Natural Argan Beauty products range from everyday care to the more luxurious and indulgent.One of Izil Natural Argan Beauty’s top selling products is the Multi-purpose Argan Oil.Containing 100% pure bio argan oil it is perfect to use on the face for anti-aging, the body for dryness, blemishes and stretch marks and also for repairing damaged hair.It is 100% organic, chemical free and has an incredibly high concentration of vitamin E, antioxidants, carotenoids and fatty acids including Omega 3, 6 and 9. Izil Natural Argan Beauty's Face Care Collection blends delicious ingredients such as saffron, barbaby fig, honey and green tea, blended with argan oil to create the '3 Fruits' Youth Generating Cream, the Golden Glow Face Mask, and the Green Tea Antioxidant Face Mask.The Izil Natural Argan Beauty Body Collection consists of antioxidant rich Green Tea Body Scrub, and the smoothing Green Tea Body Lotion. Finally, Izil Natural Argan Beauty's indulgent Hammam Collection, includes a variety of richly nourishing and deeply detoxifying products such as the Beldi Black Moroccan Soap, the special scrub loofah, the ultra-Detoxifying Body Mask Powder and a Re-Mineralizing Body Mask, containing both Rhassoul Clay from the Atlas Mountains of Morocco.